There will be no Republican presidential primary election in Colorado. In a move design to weaken Donald Trump and bolster Ted Cruz, Republican party leadership has chosen to deny Colorado voters their say in the primary. Colorado's electoral votes will all go to Cruz. Regardless of what one may think of Trump or Cruz, this is clearly an unethical action given that America is supposed to elect its leaders by popular vote. When such actions occur, Pallas on the chart of the perpetrator(s) and the local regime will be undergoing a transit which undermines her power. These transits are, as always, any aspect from Pluto, any discordant aspect from Jupiter, and any aspect from the South Node which is stronger than the concurrent aspect from the North Node. I didn't find an exact time (or date) for the announcement, but the relevant players are slow-moving enough that an exact time doesn't matter. Transiting South Node is quincunx Colorado's Pallas, exacerbated by transiting Chiron conjunct the transiting South Node. 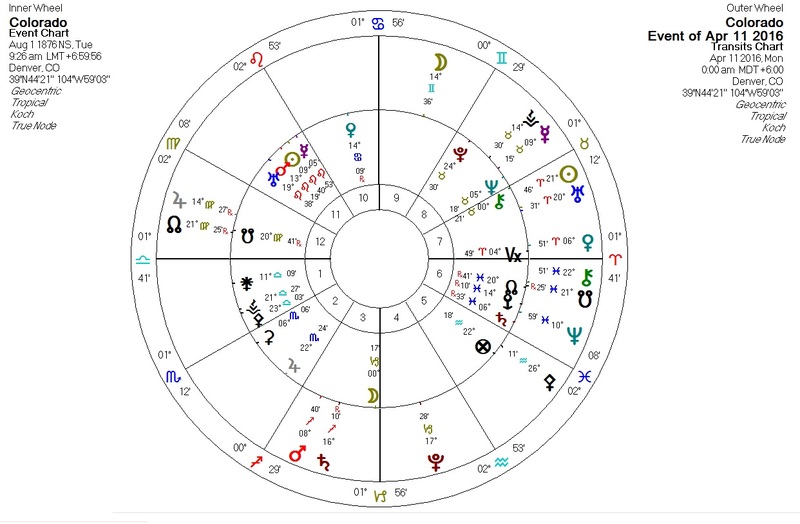 Not shown, transiting South Node and Chiron square Trump's opposition between the Sun and North Node and the Moon and South Node. Also, the US Sibley chart is currently in a Pallas return, suggesting that ethics in one way or another are currently highlighted. Yes, Republicans. Your "leadership" is not your friend. Quite the reverse.